Seasons in Rome. Essay by Anna Maria Cossiga. Three poems by Mebane Robertson. The Truth in the Mirror. Story by Paolo Lagazzi. Translation from the Italian by Nicholas Benson. Ferko. Poem by Gabriele Tinti. Translation from the Italian by David Graham. Two poems by Emily Sklar. 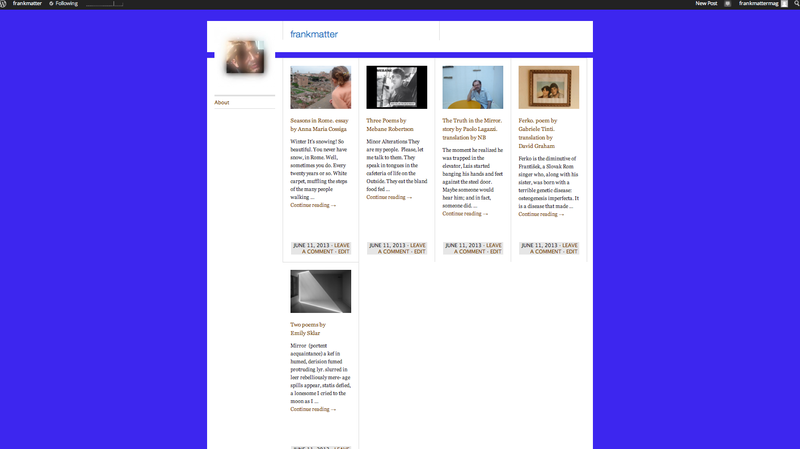 The contents of the first issue can be found by scrolling down the homepage.